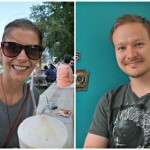 Our 20th “Follow them Friday” features Philipp & Emily from Tastes of Brussels blogging in English. We launched TastesofBrussels in 2012, that’s when we took our first steps in foodblogging; we had been blogging about other things before that already. We sat down with a glass of wine and brainstormed ideas – after a couple of those sessions TastesofBrussels was the best we could come up with that was not already in use by someone else. Our favourite would have been foodisyourfriend.com, but that was already taken. Curry, both home-cooked or in a good Indian restaurant. No. But it probably started with lots and lots of currys! Working, reading, travelling – and, of course, cooking and eating! Wow, this totally made my day! Thank you so much, guys It’s quite funny since I’m also a fan of your blog too. Keep up the good work and of course, thank you BFF for bringing all of us together!